I want my Fox Soccer Plus! 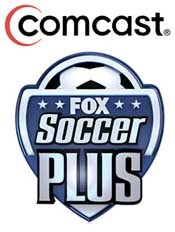 Two weeks after its debut, Fox Soccer Plus still isn't available in Philadelphia for Comcast subscribers. If you are a Comcast subscriber in the Philadelphia area you are about to enter your third weekend without Fox Soccer Plus. The new channel, which began broadcasting on March 1, replaced Setanta USA, which had previously only been available in two or three select Comcast markets. Without Fox Soccer Plus you’ve missed Portsmouth’s FA Cup victory over Birmingham. You’ve missed having the choice of watching Lyon stick it to Real Madrid live at 2:30 p.m. in the Champions League rather than having to wait for the delayed broadcast at 5pm on FSC. This weekend you will miss a classic London derby between West Ham and Chelsea as well as Manchester United against Fulham. Next Sunday you will miss Manchester United against Liverpool. Of course, if you subscribe to Direct TV or Dish Network, you already have Fox Soccer Plus. HD is soooo two hours ago. With the 3D entertainment trend re-awakening after decades in hibernation (seems like I’m one of 3 people who hasn’t seen Avatar yet), ESPN has announced that it will be launching a network broadcasting sports in 3D. Stupid glasses required. The very first such event to get the 3D treatment? None other than match numero uno of South Africa 2010, with the host nation taking on Mexico. It remains to be seen if any other games will be broadcast in the new format, but you’ve gotta believe a lot of El Tri fans are going nuts over the prospect of seeing their heroes in three dimensions without leaving the house. Gimmick? Well of course its a gimmick. But could this be a cool way to watch the beautiful game? I’d certainly give it a shot for this game. But I don’t know if I’d risk trying to watch the USA v. England game in those silly red and white frames and have it be a waste of time/money. That is of course, if you even have the right equipment to begin with. I just looked at my TV and uh…I don’t think it does that. What do you think? It’s Wednesday morning which means, for me, checking out the Fox Soccer Channel website to print out the schedule of games they are showing over the weekend and following week. When I did so this morning I found a new website. It’s organized differently and that will take some getting used to. One improvement is that they’ve dispensed with the clunky drop down menus that used to be at the top of the page and moved the links that used to be there to a table at the bottom of the page.